Blair Pachereva knows how to think on the fly and he owes much of his skill to a lifetime of playing lacrosse. 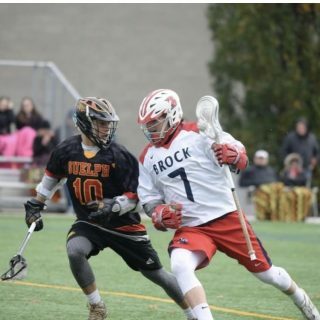 It’s an exciting sport to watch and play says the 19-year-old Brock University student and he credits the parklands and playing fields of West Niagara as his “happy state” where he spent his youth growing up in Beamsville. He now plays for the Brock varsity team and the St. Catharines Spartans, Ontario Jr. B lacrosse league. Lacrosse was based out of Jordan during the years Pachereva played for the Lincoln Crush and he said it’s so important that the organization, rebranded in late 2018 as the Redcoats Lacrosse Association based at the Peach King Centre, is offering the same opportunities to the youth right across West Niagara. Pachereva was on the ice rink playing hockey and learning to skate when he was three years old. He picked up his first lacrosse stick at the age of four and said skills learned in hockey served him well. It was finding a sport to complement his winter hockey that brought Pachereva to his passion for lacrosse. The running develops foot speed and carrying the stick builds arm muscles. “It was my happy state, to be playing outside,” Pachereva said. Through the years he has never been far from a rink and also joined in a variety of sports including baseball, soccer and basketball. “My Dad also played lacrosse when he was a kid. My Mom played too, even though we made fun of her,” Pachereva said. Pachereva is just one example of a community youth who has found his wings through his years of sports and the support of his parents and the local lacrosse association.